As a writer and journalist, I’ve been attached to a keyboard as long as I’ve been employed. While I missed the typewriter-in-the-newsroom era, I still understand the nostalgia of using one. I first learned to type (self-taught, age 7) on a Smith Corona in the 80’s. 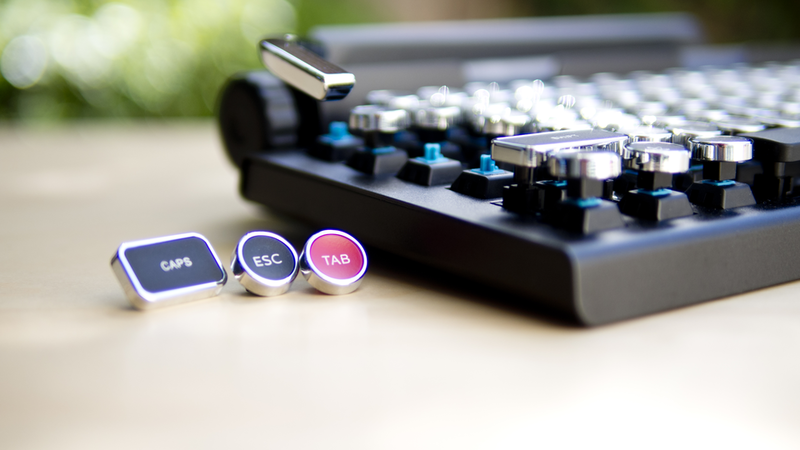 There’s something more satisfying about the clomp-clop of typewriter keys mashing out your words, rather than the soft phush-phush of a regular computer keyboard..
That’s why I think the Qwerkywriter keyboard is going to be huge when it goes on sale (it’s currently on preorder, details below). 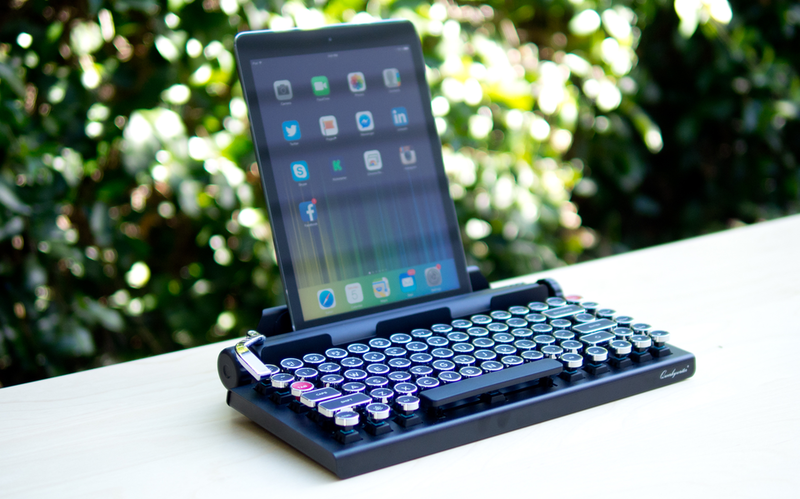 This keyboard has multiple uses; you can use it with your laptop or desktop, or with your tablet or phone. It’s a really cool experience using this keyboard. I absolutely love the feel of the industrial strength mechanical switches that give the device a unique clacky feel and sound. I will say, it takes a bit of getting used to to operate, in that the keys are a different shape from the square computer keyboard keys, and the spacing and distance is also different. Not to mention punching typewriter keys requires just a touch more force than a younger generation will be familiar with. 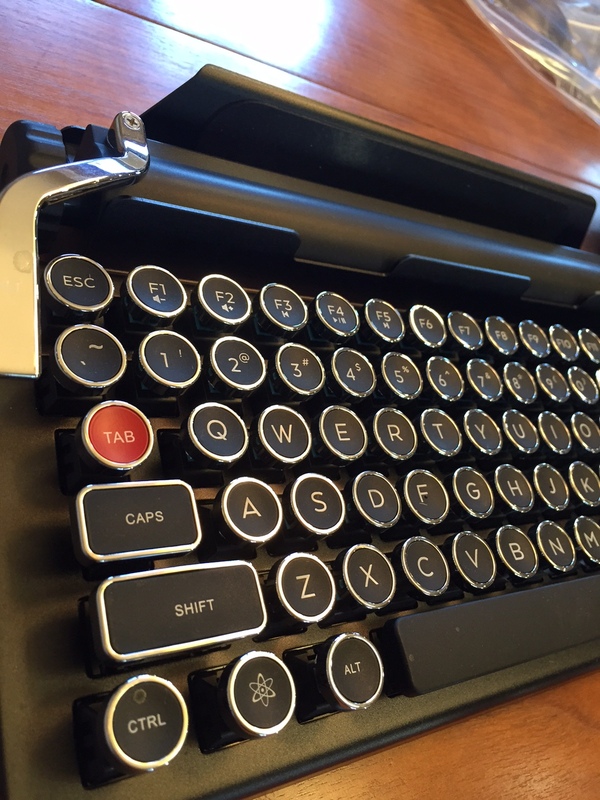 While the Qwerkywriter is super fun to use, it looks really really nice in my home office. In fact, I’m thinking of painting a frame on the wall and making a space to hang it when it’s not in use so it can serve as beautiful retro art when its not in use. Get the Qwerkywriter from the company’s website Qwerkywriter.com for $329USD (preorder price. After that it goes up to $399). Erin is a blogger, reviewer, and TV tech geek based in Calgary, Alberta. She hangs out with the Geeks and Beats podcast crew monthly.